BoyCot This Public Meeting Bring Your BullHorns and Tell City Staff They Are Misrepresenting the PNA’s Efforts to Preserve the Pico Neighborhood. On Tuesday July 27th, the Santa Monica City Council will decide on whether to uphold the decision of the Landmarks Commission to designate the 15 bungalows at 2002-08 21st Street as Structures of Merit based upon their age and the rarity of their architectural style. 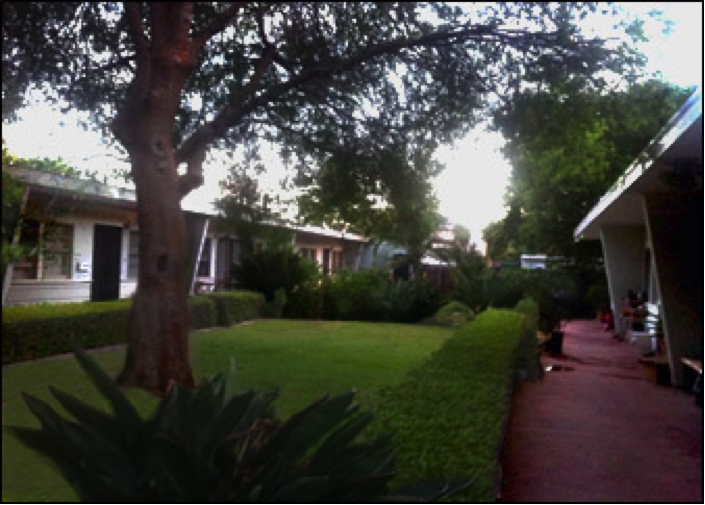 On December 8, 2014, the Landmarks Commission considered all the material in the record, heard public testimony, and voted to designate Structures of Merit for the two Mid-Century Modern residential buildings sited in a courtyard configuration, located at 2002-08 21st Street. Subsequently, the property owner, Park Virginia LLC, has filed an appeal of the December 8, 2014 decision of the Landmarks Commission. The PNA Board supports the staff recommendation that the City Council denies the appeal and upholds the decision of the Landmarks Commission to designate the subject buildings based upon the findings that the structure is a minimum of 50 years of age and was constructed between 1949 and 1950. The properties and their structure is a unique or rare example of an architectural design, detail or historical type. The Pico Neighborhood has a history of being buffeted and changed by City planners and developers. Discrimination, market pressures, and city government decisions have all had a profound effect on the stability of the neighborhood. Rapid gentrification continues to bring rapid changes; our current residents are threatened by new commercial development, by a relentless housing market that continues to generate significant rent increases and high priced condominiums that very few residents can afford. Protecting the character and scale of the neighborhood is what is at stake in relation to this property designation. City leaders must look at this project in the context of the rest of the neighborhood and not as a stand-alone property. The project site is currently developed with one-story bungalow apartments containing a total of 15 residential units. The parcel at 2002 21st Street contains five residential units in two buildings. 2008 21st Street contains four units in two buildings. 2014 and 2018 21st Street each contain three units in two buildings. All of the buildings contain garage structures adjacent to the alley. The buildings were constructed between 1935 and 1951. A low concrete block wall and wooden fence border the site adjacent the public sidewalk along 21st Street and Virginia Avenue. Landscaping includes bottlebrush, fan palm, oleander, and a variety of low growing shrubs and herbaceous ornamentals. The site is designated Low Density Housing and zoned R2, Low-Density multi-family. The project site is bordered by residential uses. The proposed project involves demolition of the existing improvements and the development of a two story (plus roof deck) 21-unit condominium complex on the 0.66-acre project site. Two of the proposed units would be reserved as affordable housing units. A total of 48 parking spaces would be provided within a subterranean structure containing 21 private two-car garages. A minimum of four guest parking spaces are also proposed within the subterranean garage. On June 23rd the City Council voted to approve the creation of the Pico Neighborhood Zoning District. As of July 24th the Community Development Department has 18 months to create the elements the PN Zoning District. At the PNA’s Annual membership meeting, members and residents were asked to prioritize the goals of the PN Zoning District that will be presented to Rick Cole, SM City Manager, David Martin, Director of Community Development Department and the City Council. Protect the quality of life of neighborhood residents against potential impacts related to development- traffic, noise, air quality, parking and the encroachment of commercial activities. Provide for the maintenance and continuation of a mixture of residential building types that range from older single-unit family homes to multi-unit housing. Extend from Olympic Blvd. to Colorado Blvd. Provide sites for institutional, residential, and neighborhood serving uses such as parks, community facilities and locally owned small businesses and neighborhood stores that provide goods and services to support the daily life of diverse residents within walking distance of neighborhoods and complement surrounding residential development.